Are you looking for a really innovative marketing book that’s going to challenge the way you think? 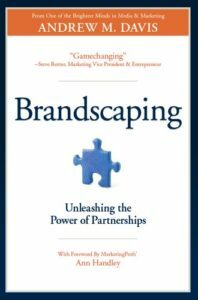 The book, Brandscaping by Andrew Davis, has been called game-changing by so many rock stars in the marketing world. This book is full of ideas on how to grow partnerships and grow your business. It looks at marketing in a very different way, using content as currency. What I loved was his philosophy of pulling and tapping into resources like internal, money, facilities, even your intellectual property. I also love that this book talks about, how to start small, but think big. If you haven’t read this book, I would highly recommend you do. If you aren’t following him on social media, I would encourage you to do that, as well. Brandscaping, brilliant book by Drew Davis, check it out. Need more convincing? Check out my video on YouTube and share it with those you believe would benefit from this book.